The Simien Mountains are one of the best trekking destinations in Africa, a stunning mountain range characterised by jagged peaks, huge gorges and panoramic views across the landscape from atop the escarpment that bisects the park. It is especially beautiful just after the wet season when the green landscape is at its most vivid. The National Park is home to some rare animals endemic to this region including the shaggy-haired gelada baboon (the highest-dwelling and most social primates on earth), the Walia ibex and the rare Ethiopian wolf. Some trips to Ethiopia include a brief period of trekking in the Simiens as a taster but longer, dedicated tours are available that comprise an 8-10 day trek from the town of Debark to Ras Dashen, at 4543 metres the fourth highest peak in Africa. Trek through the Danakil Depression, one of the hottest, harshest and, at -125 meters below see level, lowest places on earth, to Erta Ale Volcano before venturing high into the Simien Mountains to summit Ras Dashan, the highest point in Ethiopia at 4,510 meters above sea level.This charity trek is our major fundraiser for our 2016 Wild Frontiers Foundation campaign - 3 countries, 3 education projects, £30,000. Ethiopia is one of our favourite countries, which we have enjoyed travelling to for over 10 years. With its diverse and challenging environments, it makes the perfect setting for a fundraising trip that will help give back to young people in a community that is close to our heart. The money raised from the trek will go towards the Wild Frontiers Foundation project to establish four new e-learning centres in remote school across Ethiopia. It costs £2500 to set up each e-learning centre and install 25 recycled computers, loaded with educational software. Teachers from the schools will also be trained in basic digital literacy skills, simple hardware maintenance and how to use computers to teach a different subjects. This is a self-funded trek, in that you pay your way to take on the challenge, and we ask you to commit to raise a minimum of £500 for the cause. This trip offers amazing sites and challenges in equal measures, also giving you the opportunity to kick off your walking boots and enjoy the country's colourful capital, Addis Ababa, the UNESCO World Heritage town of Lalibela with its amazing rock hewn churches and the medieval castles of Gondar. Ethiopia is a very different destination for a trekking holiday in Africa. Known as 'The Roof of Africa', Ethiopia is a land of surprises, with a wealth of superb trekking and a rich cultural heritage to explore. Ethiopia includes some of the finest mountain scenery in Africa, notably in the Simien Mountains which have been designated a World Heritage Site. This highland area in the northern part of Ethiopia includes many summits over 4000 metres, the highest being Ras Deshen, the fourth highest mountain in Africa. 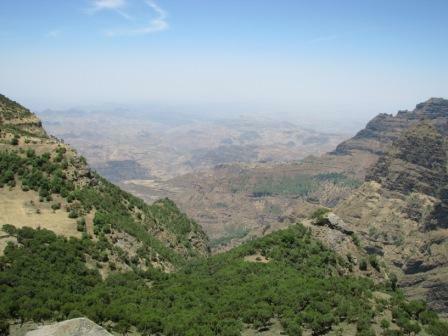 Geographically, the Simien Mountains comprise several major plateaux, which are underlain by basalt lavas thousands of metres thick. It is the erosion of these lavas that has created the dramatic escarpments and freestanding pinnacles which are characteristic of the Simien Mountains range and which are comparable in terms of spectacle to the Grand Canyon. We access this northern region by way of a short internal flight from Addis Ababa to the ancient capital of Gondar. This latter is a wonderful, historically important, city with an unusual collection of 17th century castles and churches. Six days of trekking takes us through a land of natural wonders and of rare wildlife, including the Simien Mountains red fox, the strikingly-maned Gelada baboon and the majestic lammergeier or bearded vulture. Trekking through several villages, notable for their carefully tended farmland and friendly people, our walking reaches its climax at the summit of Ras Deshen (4620m), where the views extend northwards to Eritrea. A 2-day visit to explore Lalibela, with its collection of amazing churches, carved out of solid rock, is a great way to end this exceptional walking adventure holiday to the Simien Mountains of Ethiopia. Providing a variety of completely new experiences, Ethiopia is an adventure travel destination for the trekking connoisseur to explore. The Simien highlands of northern Ethiopia form one of the major mountain massifs in Africa. A highlight is the ascent to the summit of Ras Dashen - Ethiopia's highest peak and the fifth highest on the continent. As we trek through this isolated region we admire the spectacular scenery of rocky plateaux, spires, mesas and deep gorges.